Since Congress passed tax reform, American families have seen bigger paychecks and more opportunity. But there is still a lot of confusion about the Tax Cuts and Jobs Act. Over the past few months, The Heritage Foundation team has been traveling the country to explain the benefits of tax reform. Below, we answer the most frequently asked questions about last year’s tax cut and the effort to pass Tax Reform 2.0. What is in the Tax Cuts and Jobs Act? How much will I save this year? What is “Tax Reform 2.0,” and why is it important? Why were the individual tax cuts not made permanent to begin with? What does the Tax Cuts and Jobs Act mean for the economy? Why should I care that businesses got a tax cut? I heard wages are stagnant. Is that true? How does tax reform help? Will the cap on the “SALT deduction” raise my taxes? Can I still take the mortgage interest deduction? What is expensing, and why is it important? Is the Tax Cuts and Jobs Act just a tax cut for the rich? Are stock buybacks proof that tax reform only benefits the wealthy? Will the tax cuts really add $2 trillion to the national debt? A: The Tax Cuts and Jobs Act was the most sweeping update to the U.S. tax code in more than 30 years. The reforms simplified taxpaying for most Americans, lowered taxes on individuals and businesses, and updated the business tax code so that American corporations and the people they employ can be globally competitive again. For individuals, the Tax Cuts and Jobs Act reduced federal income-tax rates, increased the standard deduction, doubled the child tax credit, repealed the personal and dependent exemptions, and capped the deductions for state and local taxes, among many other reforms. For businesses, the law permanently lowered the corporate-tax rate to 21 percent, down from 35 percent, and temporarily allowed businesses to fully deduct new U.S. investments. Small and pass-through businesses that pay their taxes as individuals also have a newly created subsidy in the form of a 20 percent deduction. A: Last year’s tax reform cut taxes for the vast majority of Americans. Using IRS data, The Heritage Foundation found that average households in every congressional district will get a tax cut in 2018. Most Americans are already receiving their tax cut through lower employer withholding. The average American can expect a $1,400 tax cut this year, and a family of four will get a $2,900 reduction. Q: What is “Tax Reform 2.0,” and why is it important? A series of three new bills that make up “Tax Reform 2.0” are currently under consideration in the House. The package would make much of last year’s tax reform permanent, introduce new simplifications for family saving, and provide a helping hand for new small businesses. The main priority of Tax Reform 2.0 is to make the cuts and expensing permanent. Simply by making the temporary provisions in the Tax Cuts and Jobs Act permanent, Congress could achieve an additional 60 percent of the economic benefit produced by last year’s tax overhaul. Tax Reform 2.0 is a good first step, but neglects to extend expensing, falling short of making the full Tax Cuts and Jobs Act permanent. Congress is also unwilling to reduce the growth rate of federal spending, which is driving up our debt and threatens the prosperity of future generations. To solidify the current broad-based economic expansion, Congress must make the tax cuts permanent—and place meaningful limits on federal budgets. Q: Why were the individual tax cuts not made permanent to begin with? A: Procedural rules in the Senate and an unwillingness to constrain spending forced Congress to make the majority of the Tax Cuts and Jobs Act temporary. Tax cuts for individuals, which are the largest tax cuts in the package, expire in 2025. Since Congress has already agreed to this package of tax cuts, it should be its first priority in Tax Reform 2.0 to make the entire law permanent. Q: What does the Tax Cuts and Jobs Act mean for the economy? A: Workers have been better off almost every year since America started its slow climb out of the Great Recession in 2009, but this year is different. Things aren’t just a bit better; we’re setting records. This summer, manufacturing activity hit its highest level in 14 years, the economy is in the midst of the longest-running period of businesses adding new jobs, and wages are increase faster than they have since 2009, when we were first climbing out of the bottom of the Great Recession. Many workers are benefiting twice from the tax cuts. First, by paying less in taxes, and second from higher wages generated by a faster-growing economy. The Heritage Foundation recently calculated that, over the next decade, the typical American household will reap an additional $26,000 in take-home pay, thanks to the cuts and the economic growth they fuel. For a family of four, the 10-year benefits are almost $45,000. That’s more than enough to buy a new car or to put a down payment on a house. Q: Why should I care that businesses got a tax cut? A: Most Americans are employed by businesses, and when businesses are doing well, workers do well, too. It is true that businesses—and all people they employ—have benefited greatly from tax reform. The old U.S. tax code pushed businesses and their new investments overseas and put American workers at a disadvantage. The new lower business taxes have reversed this trend, and the benefits are most directly accruing to workers. For the first time in history, there are more jobs than applicants. More job openings are a sign of a healthy economy, one in which employees have the upper hand. When unemployment is low, and workers have the upper hand, businesses are forced to use their tax savings for bonuses, increased wages, and better employee benefits. Tax reform lowered the U.S. federal corporate-tax rate. As a result, the combined federal and state U.S. corporate-tax rate fell from almost 40 percent—the highest in the developed world—to below 25 percent. The new rate, slightly above the world average, is making America more competitive in the global economy. Q: I heard wages are stagnant. Is that true? How does tax reform help? A: To put it simply: No, wages are not stagnant. Wages and overall compensation have been increasing slowly since the Great Recession, and that pace has recently quickened. What’s most impressive is lower-income workers are benefiting the most. Wage growth for workers in construction, hospitality, and retail has outpaced both inflation and wage growth in the rest of the economy. In May, wage growth for rank-and-file, nonsupervisory workers posted its best annual gain in almost 10 years and August’s 2.9 percent year-over-year wage increase was the largest since June 2009. Because wage growth for lower-wage workers has outpaced that of high-income earners, income inequality has decreased over the past three years. As tax reform continues to promote a strong economy, and as unnecessary regulations are rolled back, you can expect this trend to continue. Q: Will the cap on the “SALT deduction” raise my taxes? A: If you listen to the politicians in states such as New York, New Jersey, Connecticut, or California, most—including some Republicans—will tell you that last year’s tax reform will raise taxes. For most Americans, those politicians’ claims are not supported by the facts. The biggest complaint is that the Tax Cuts and Jobs Act’s new $10,000 cap on the federal deductibility of state and local taxes (the so-called “SALT cap”) is a politically motivated attack on Democrats and the states and districts they represent. Often left out of the story is that the doubled standard deduction and lower tax rates mean average taxpayers in every congressional district and every state get a tax cut. More than 88 percent of individual taxpayers in every district and every state see a tax cut or no change in their 2018 tax liability. The SALT cap is not partisan in nature. Instead, it moves towards a bipartisan goal of fairness by reducing an inequality in the federal tax code that allowed taxpayers with identical incomes to pay hundreds, thousands, and even hundreds of thousands of dollars more or less in federal taxes, strictly based on their state of residency. Q: Can I still take the mortgage interest deduction? A: Yes, if you used the mortgage interest deduction in 2017, nothing has changed for you in 2018. The Tax Cuts and Jobs Act lowered the $1 million cap on the deduction to $750,000, but only for new mortgages. If a taxpayer bought his or her house in 2017 or before, this new restriction does not apply. Q: What is expensing, and why is it important? A: Expensing makes it more affordable for people to start a business and for existing businesses to upgrade and expand their operations—things that create new jobs and enable employers to raise wages. Expensing allows companies to deduct the cost of investments immediately and mitigates a current tax bias against investment. The Tax Cuts and Jobs Act expands the old law’s 50 percent bonus depreciation for short-lived capital investments to 100 percent or “full expensing” for five years and then phases it out over the subsequent five years. The new tax law also expands expensing for small businesses by raising the cap on eligible investment and increasing the phase-out amount. Making permanent the temporary expensing included in the act and expanding it beyond short-lived investments could double the economic boost projected from the 2017 reform. Q: What is a “USA”? A: USA stands for Universal Savings Account. Tax Reform 2.0 includes a new small Universal Savings Account that would allow taxpayers to contribute up to $2,500 a year. Withdrawals would be tax-free and not reserved strictly for retirement or any other prescribed activity. These simplified accounts have proven successful in Canada and the United Kingdom, and would help Americans protect more of their savings from taxation without all the retirement strings attached. Regrettably, the proposed contribution limit of $2,500 a year is much too low. Even in its limited form, the proposed USA would give families a better option for long-term savings and simplify financial planning. The proposed USAs do not replace other savings accounts or Social Security. Q: Is the Tax Cuts and Jobs Act just a tax cut for the rich? A: No, the tax cuts are not just benefiting the wealthy. Average taxpayers in every congressional district get a tax cut, and lower-income communities get the largest percentage decreases in their tax bills. Some low-income congressional districts will see their federal income taxes cut by 20 percent or more. Even the corporate tax cut is benefiting workers significantly. Because more than 75 percent of business taxes are ultimately passed on to workers in the form of lower wages, workers can expect the biggest economic benefits from business tax reform. Wage growth for lower-income workers is already outpacing that of their higher-income counterparts. Q: Are stock buybacks proof that tax reform only benefits the wealthy? A: Publicly traded corporations buy back stock from their shareholders when they have maximized their internal investment opportunities and still have excess cash on hand. Stock buybacks simply return the excess cash to the shareholders for them to invest elsewhere in the economy. To the extent that stock buybacks increase the wealth of investors, some of the largest recipients of buybacks are public sector pensions funds and private retirement accounts. Teachers, firefighters, police, and most other current and future retirees benefit from better investment opportunities. Stock buybacks simply free up capital so that it can be used outside the existing business for more productive investments. Q: Will the tax cuts really add $2 trillion to the national debt? A: No, it’s spending that adds to the debt. Tax reform’s promise was simple. American families will send an average of $1,400 less to Washington each year. For that promise to be true, however, Congress must also reduce spending. Deficit spending today means tax increases in the future. According to the nonpartisan Tax Foundation, the tax cuts will only reduce revenue temporarily. By 2024, the tax cuts actually raise more yearly revenue than before the reform and add $448 billion to the debt in the short run. The most conservative estimates from the Congressional Budget Office show that the federal government will collect about $20 billion more this year than last. In that sense, the “tax cut” was merely a reduction in the growth rate of federal tax collections. In August, revenues were up 1 percent, but spending rose by 7 percent. Congress’ decision to slow the growth rate of tax collections while simultaneously dramatically increasing spending is a recipe for fiscal disaster. The imminent return of trillion-dollar deficits will be driven entirely by too much spending. Washington takes more than $3.3 trillion of the American people’s money every year, and that should be more than enough to cover the bills. It is possible that sustained growth outpaces current economic forecasts, and that will help the federal government raise revenues back to levels prior to the Tax Cuts and Jobs Act sooner than projected. Lawmakers should not depend on overly optimistic economic predictions, however. 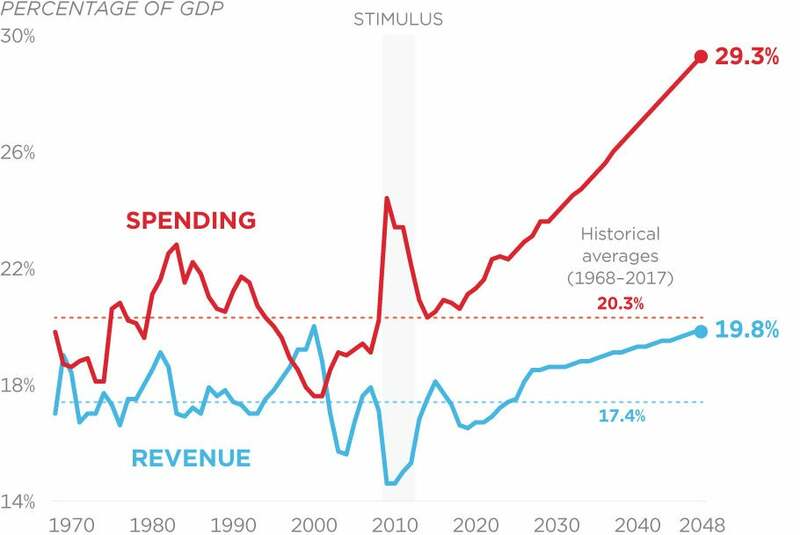 They should reduce the growth rate of spending today, and use any excess revenue from the larger economy to lower taxes further in the future.